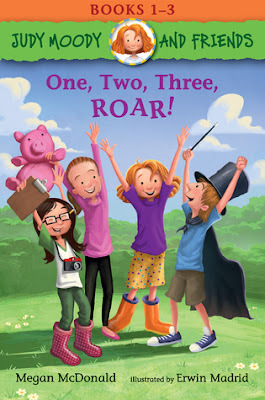 My girls are Judy Moody fans, so when I saw this title come up on Walker's press release (due for release September 12th) I thought, "This would go down well in our household." I was right. Ivy loves the full colour illustrations throughout. Esky likes that Judy is a "tryer." Me? I like that Judy Moody is genuinely funny without toilet humour (like The Princess in Black). Her reactions to her friends make me smile, and the generous sprinkling of silly similes bump these up on the language enrichment scale. Many of the other early chapter books the girls read are descriptive (e.g. "His eyes went wide") but can be sparse on the figurative language. Judy's eyes "[grow] as big as gumballs." That's the sort of line a little person is likely to internalise and pull out in everyday life because it struck them as amusing. There are also delicious puns, allusions and loads of plays on idiomatic speech. There's even a basic introduction to Pig Latin. I love books that play more with language. Yes, early readers need stories foremost, but Judy Moody and Friends has relatable narratives and enriching language. Win. Although this story features a pretty spoiled little girl, snooping and a disagreement, it's funny and well-told. It even includes a spin on the game Pass the Pigs within the story. Tempers flare after an accident upsets Rocky and a trick upset Judy. Thankfully the two work through things to perform a final act together. Literally digging for a story, Amy and Judy think they've found something truly special, only to learn their discovery isn't so impressive. Following another lead, they encounter more adventure (made more adventurous by their imaginations). This ends with Judy taking on a new hobby of her own. Although Judy Moody is moody, she is overall a likable character and there are consequences / is resolution for problems that arise in each story. Both Esky and Ivy read this collection the day it arrived and reported they want more Judy Moody and Friends. It makes me smile.